Yes, I know that Christmas is around the corner. But here in New York’s Hudson Valley, we’re enjoying April-like weather. To celebrate, I made a batch of Caramel-Chocolate Mousse, and devoured it on the sun-flooded front porch. And separate them. 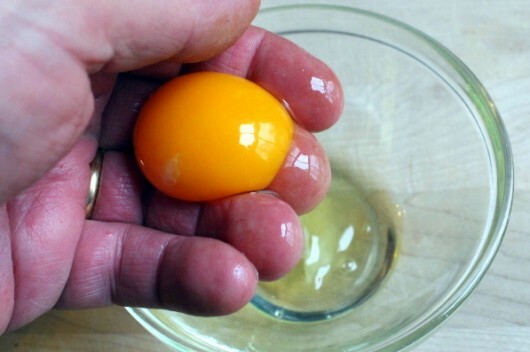 Put the yolks in a small bowl, and the whites in the work-bowl of a standing mixer. Or, if you are using electric beaters, put the whites in any large(ish) bowl. 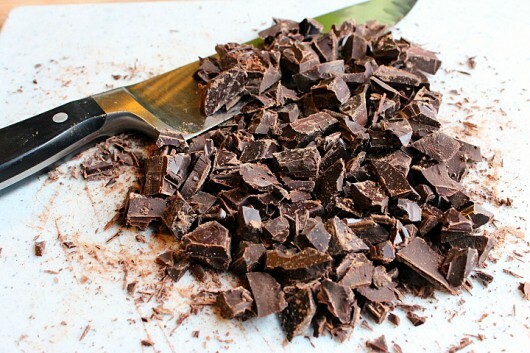 Then snag 6 ounces of high-quality chocolate, and chop it. I used a combination of bittersweet and semi sweet chocolate. And that’s all the heavy-lifting prep-work this recipe requires. Let’s make the dessert! 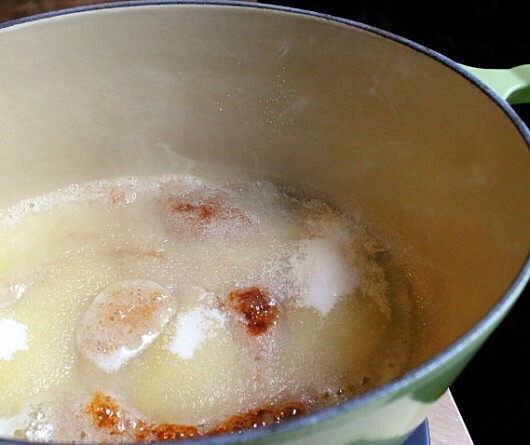 Put 3 tablespoons diced, salted butter in a heavy-bottom saucepan, and let it melt over medium heat. After the butter melts, sprinkle 1/2 cup sugar evenly over the butter. 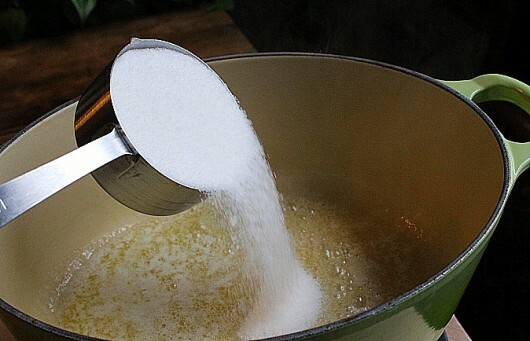 Don’t stir it up yet — just let the sugar sit there for about 1 minute. And stir slowly but constantly until the sugar melts and turns a lovely shade of amber. 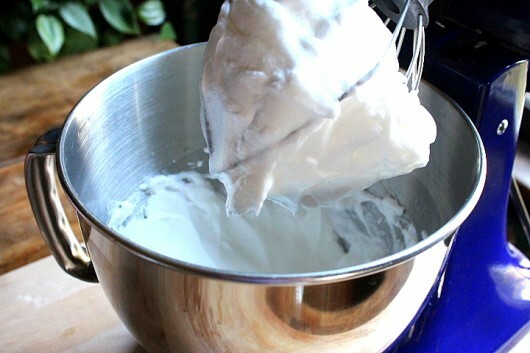 Then trade your spatula for a wire whisk, and, while whisking constantly, slowly add 3/4 cup heavy cream. Remove the pan from the heat. By now, the sugar will have turned walnut-brown. 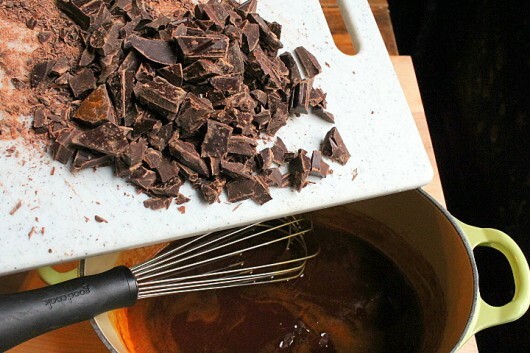 And whisk continuously until the chocolate melts, and the sauce looks satiny-smooth — about 1 minute. Then whisk in 1/4 teaspoon sea salt. 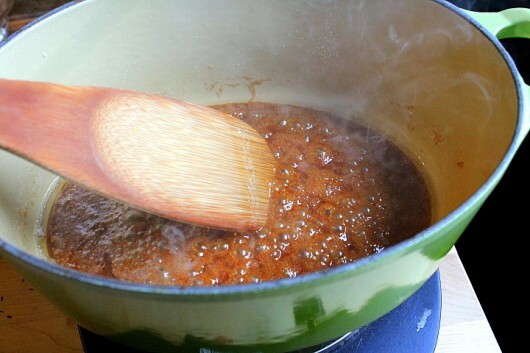 Scrape the sauce into a large bowl, and let it cool to room temperature (or nearly room temperature) — about 15 minutes. 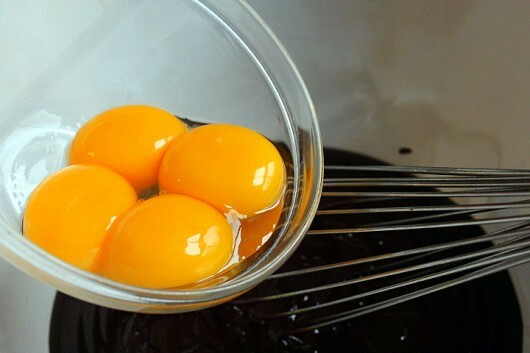 When the chocolate-caramel sauce has cooled, beat in the egg yolks. Also, beat the egg whites into a cloud of stiff peaks. 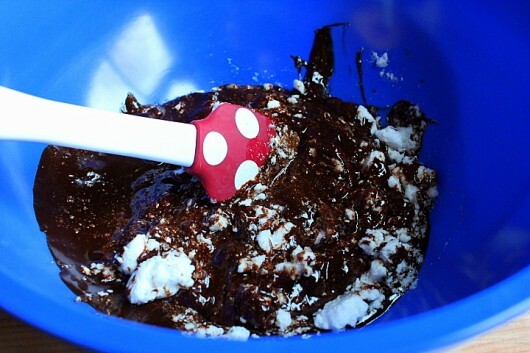 And use it to scoop about 1/3 of the whites over the caramel-chocolate sauce. Fold the whites into the sauce to lighten it. Then fold in the remaining whites. At this point, the sauce will be light, fluffy, and screamingly-delicious. Not try to eat all of it. Divide the mousse between 6 ramekins. Or, for a more-casual presentation, spoon it into small mason jars. I spooned my mousse into 3 blue and white bowls. Since the bowls are larger than ramekins, they contain 2 servings each. Refrigerate the dessert until set — at least 2 hours. Shall we tuck into this fabulousness? Grab a spoon and join me on the front porch. 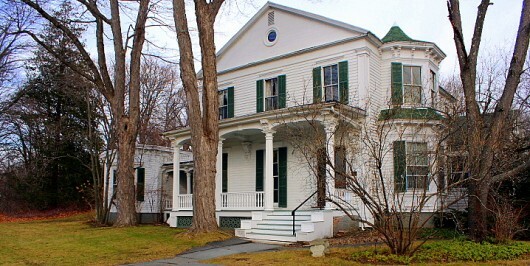 The front porch in question. As you can see, I added a tiny dollop of softly-whipped cream to each serving. You, on the other hand, don’t have to add any garnish at all. The mousse doesn’t need it. 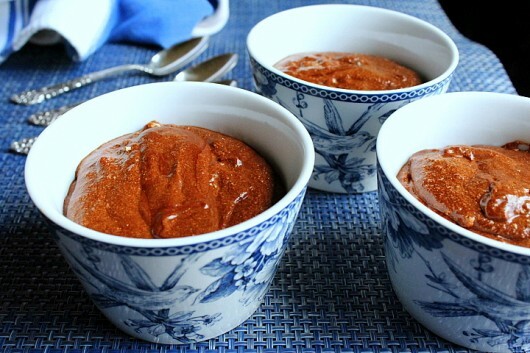 For such a heavenly dessert, Caramel-Chocolate Mousse is a breeze to make. I hope you’ll try it some day. I love this dessert. It's light enough to serve after a heavy meal, but rich enough to satisfy a serious craving for chocolate. Even the gluten-phobic can enjoy it. 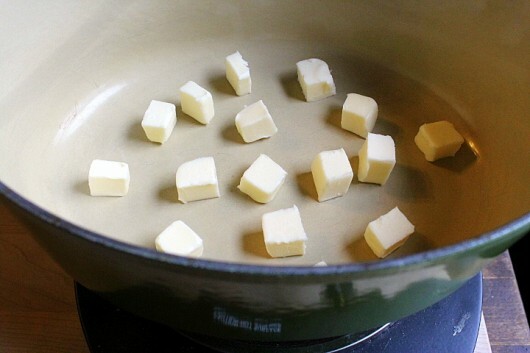 In a medium-size, heavy-bottomed pot, melt the butter over medium heat. 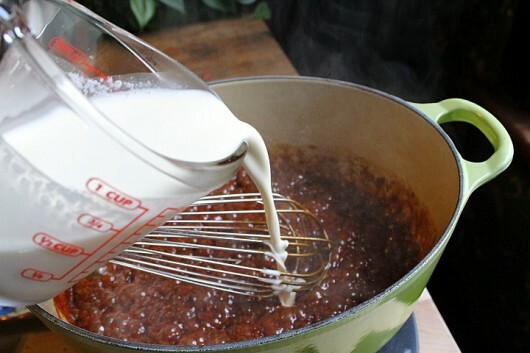 Sprinkle the sugar evenly over the melted butter, and let it sit there until it starts to color -- about 1 minute. Then stir slowly and constantly with a heat-proof spoon or spatula until the sugar turns an amber shade -- about 2-3 minutes. Then, using a wire whisk, slowly whisk in the cream. 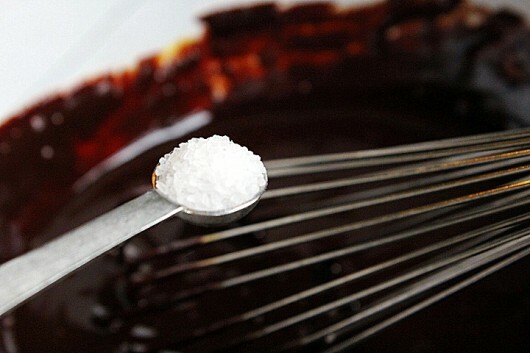 Off heat, whisk in the chocolate and the salt. 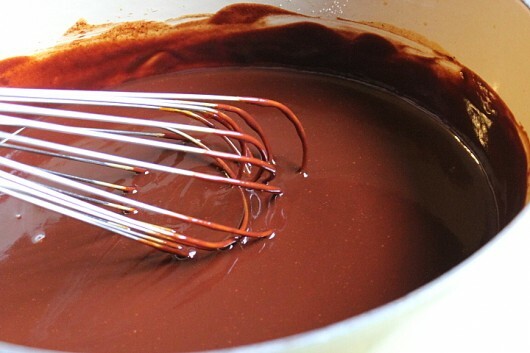 Keep whisking until the chocolate melts and the mixture looks satiny smooth -- about 2 minutes. 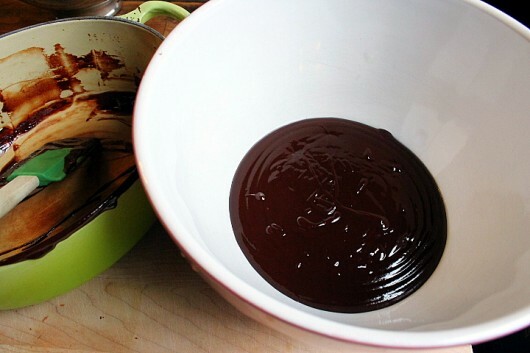 Transfer the caramel-chocolate mixture to a large bowl, and let cool to (approximately) room temperature -- at least 15 minutes.Then beat in the egg yolks. Beat the egg whites to stiff peaks. Fold 1/3 of the whites into the caramel, just to lighten it. Then fold in the remaining whites. Divide the mousse between 6 ramekins. Refrigerate until set -- at least 2 hours. 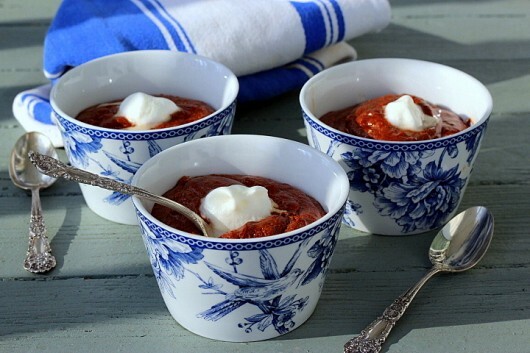 Serve with or without a tiny dollop of softly-whipped cream. Think you’ll give this recipe a go? You can let me know by leaving a comment. And don’t forget to sign up for my email updates. Looks delicious. I hope you didn’t have to look at the red ladder your thoughtless contractor left behind. I think I will make this mousse for my next dinner party. It’s unseasonably warm in my part of Canada too (but I’m not complaining!). There is no snow and the grass is still quite green. Was planning to make my favorite chocolate pudding (from Richard Sax) this very day, but think I’ll give this caramel-y version a try. Local is the operative word in your ingredients list. For years and years and years I made “French Silk” pie, and for the those same years and years and years I gave away quarts and quarts of eggnog at Christmastime. Then for a number of years people all over the country started becoming horribly sick from tainted, uncooked or undercooked eggs, and I stopped making French silk and eggnog. I have a local source of organic eggs I trust, but I wouldn’t trust eggs from big commercial egg “factories” unless they were cooked. Oh, and I’d walk on hot coals for bowls like yours. Love those birds, and anything blue works for me. Hi Mary – Excellent point. 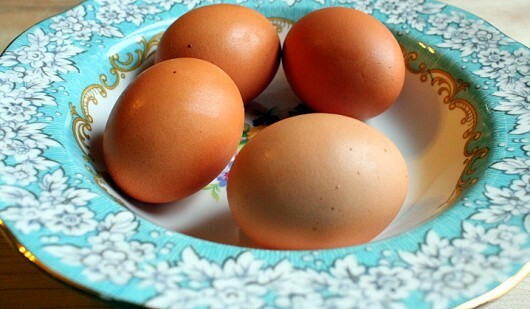 The only eggs I trust (and use) are local eggs from happy, peppy, free-range chickens. Glad you like the bowls! It’s terribly exciting to realize I have every one of these ingredients and tools on hand and can bypass the store on my way to culinary bliss. We are also experiencing April-like weather, mud included, and I am pulling weeds to have a head start on next spring. I remember a chocolate mousse of yours that I made and I think this may surpass that one with the addition of caramel. I agree with Mary in Iowa that those are fabulous bowls. I’ve not seen eggs where the shells have been treated, but then, I haven’t specifically looked for that either. I am so glad you remind us to pull out the pretty dishes and put them to use. I am going to serve this yummy recipe in family china as soon as our kids get home next week-end. By the way, and I don’t mean to offend anyone here, but my loving husband has been preparing his secret recipe Caesar Salad for our friends and family most every week-end for at least 25 years….raw eggs and all….with no one ever getting sick. What are the odds?? Sorry this is a belated birthday greeting! I cat and dog could not get together on the accompaniment…..Labrador retriever kept beating her tail to the beat and the cat was meowing harmony…..did you like it??? Oh, and on a gardening note, I have dandelions growing in my grass here in SW Michigan. Guess pulling them is better than blowing 2′ of snow off my drive!!! I buy pasteurized eggs from my grocery store. Are they safe to use in this recipe? 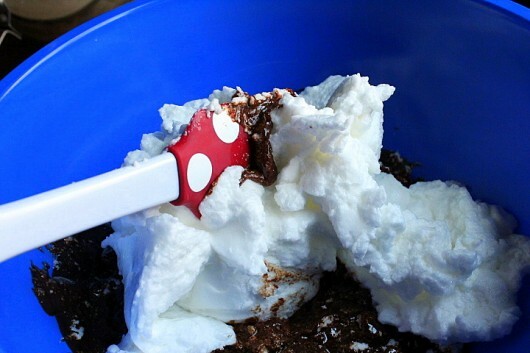 Hi Beverly – Let me know how the mousse turns out for you! 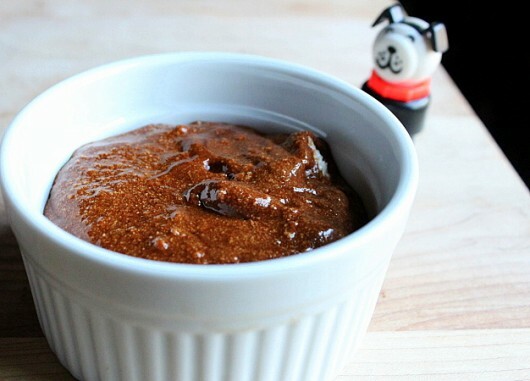 Hi Badger – Glad you liked the mousse recipe I posted back in 2012. This 2015 version has its own, unique deliciousness. Hi Nancy R – Thanks for providing the egg info! Hi Belinda – Excellent point. 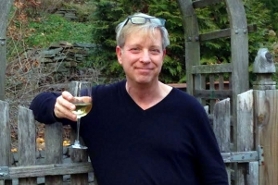 I regularly eat raw organic eggs from local, free-range chickens, and have never become ill.
Hi Sherry – Give my regards to your pooch and kitty! This looks so fabulous Kevin! I’m going to make this as I love caramel and chocolate. My eggs are organic (sometimes store bought) but usually they straight from local free ranging chickens.I’ve never had a problem either. However, my mum bought a dozen eggs at a grocery store to boil – and after being bioled, they were bad within a few days. I’ll stay with my natural sources. 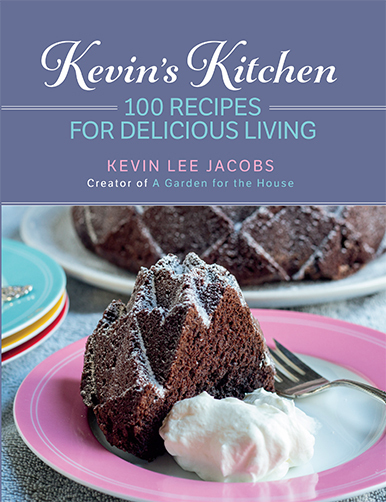 Thank you, Kevin, for another mouth-watering recipe I must try in the new year! I, too, love your blue bird china & would love to know the brand. Thanks & Happy Christmas, Kevin! 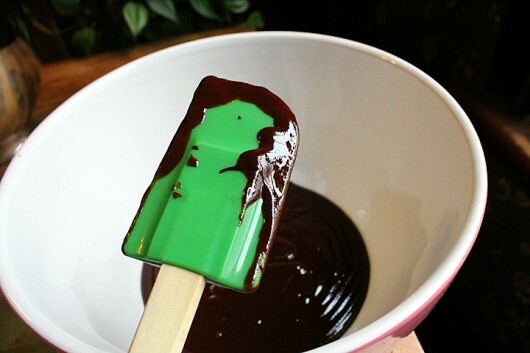 Kevin to the rescue…..have been agonizing over making a dessert…..everyone loves chocolate and this will be easy and a treat for me……best wishes to you, the silver fox and lily the beloved beagle……..
Yum! I love chocolate mousse. this looks fabulous! Merry Christmas! Kevin, I need 12 servings for a party. Should I make this twice…..or can I double the ingredients ? I looks perfect for my party. The only problem I see is that my tongue can not reach the bottom of the bowl! Hi Ava – I can’t say for certain, but I think you could make one batch with double the ingredients. That’s what I’m planning to do when I re-make this dessert for a Christmas dinner party. Great dessert. Will try it. Merry Christmas to you and your family. i certainly enjoy your website. 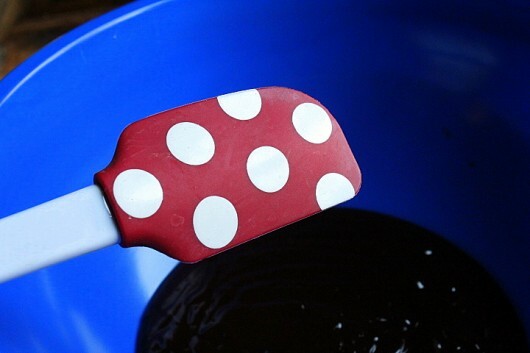 I don’t have a polka dotted spatula – a food faux pas I will correct as soon as possible – but I’m hoping my old blue, green and white striped standby spatula will work. I intend to find out! I love those blue & white custard cups. What pattern is that? Wow, this sounds so good! I can’t wait to try it. We do not worry about raw eggs, as they come from our very own ‘girls’ and are quite safe. Would it be okay to use unsalted butter and just add a little more salt? Thanks for all our great recipes. I enjoy making and sharing them! Hi Deborah R – So glad you like the blue and white cups. I’ll try to find a source for you. Hi Teresa – Jealous that you have your own backyard hens! If using unsalted butter, just increase the amount of salt. You can certainly use even more salt than I did, especially if you like salted caramel! Ho, ho, ho! I will certainly be trying this recipe during the holidays! Happy holidays to you and yours, and please give Lily a scratch between her ears from me (that’s the part they can’t reach, right? Looks great, I think that I just found my New Year’s Eve finally. I’m having eight can I just double it or should I make it twice. This is just too sinful for a Sunday!! We will be going to my friend, Brigitte’s/Ruedi’s home…a Swiss home…where food is wonderfully delicious…….always……….I will make this dessert for her and her company for New Year’s…thank you , Kevin….looks great! YUM! Will try this recipe too! Thank you! I am quite certain this is what angels eat!!!! Light and fluffy- just heavenly!!!! 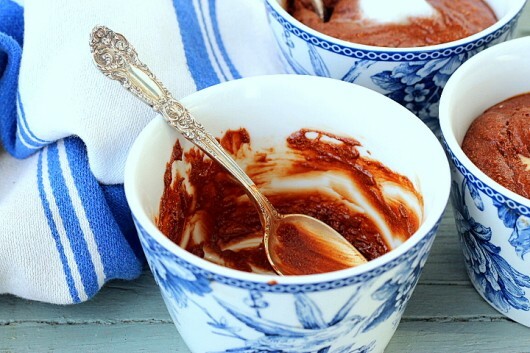 The salt in this recipe really keeps it from being “too” sweet…and the caramel is such a rich addition to this dark chocolate mousse- really elevates it to new heights!!! What a special dessert this will be to serve to guests and loved ones as we gather for the holidays! Thanks for sharing Kevin!! Thanks for this recipe AND the glogg! ENJOY! Kevin, would this recipe work if I just put all of it in one larger bowl for people to share? If so would any adjustments need to be made? Hi Kim – Yes, you absolutely can serve this from one bowl instead of making individual servings. I should have mentioned this perk in the step-by-step above. Enjoy the mousse! aaaaaand another shout out for the beautiful bowls. so perfect for this perfect dessert! Kevin, how far ahead can this dessert be made? Hi Susan – This will be my Christmas dessert. I’ll make it 24 hours in advance of serving. I made this for our Christmas Day buffet. I put the mousse into 12 shooters and still had enough for 4 small ramekins. A squirt of whipped cream and a tiny mint leaf added made for an enticing dessert. it was delicious!